【TRUE HD BEATS HIGH FIDELITY SOUND】Bluetooth Headphones featuring latest Bluetooth 4.1 CSR technology and state of the art acoustic components that produce incredible sound quality with deep bass and crystal clear treble. 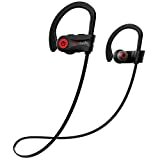 【IPX-7 WATERPROOF RATING】With ergonomic design and silicone ear hooks, wireless headphones secure stay on your ears, feel great to wear and will never fall out. Upgraded Waterproof Rating, 100% prevents ordinary splashing water and rain. 【LONGEST BATTERY LIFE】The new improved lithium polymer battery allows seamless enjoyment of music for up to 9 hours and 240 hours stand-by with a charge of only 1.5 hours. 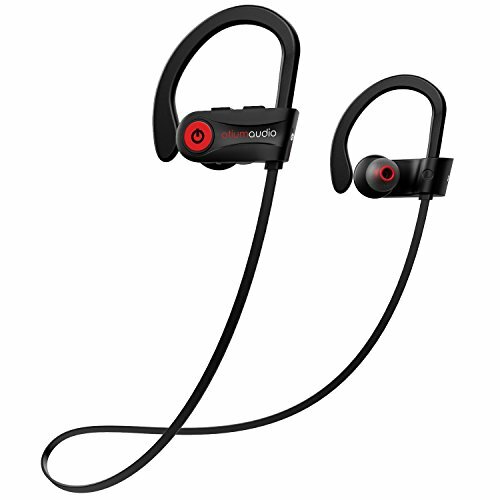 Neckband design prevents troublesome wires from tangling during your workout. 【WITH EASY TO USE BUTTONS】Allows Skip/Play/Pause on your music tracks as well as all phone use without reaching your phone. Can be connected with two devices simultaneously. Super quick pairing with android, IOS and other bluetooth devices.